Dragon slayer is a simple but deceptively challenging push your luck dice game. There are 4 sets of dice: (Easy) Blue dragon dice, (medium) green Dragon dice,(difficult) Red Dragon dice, and the slayer’s dice. Each set of dragon dice has 3 dice: one die with the head of the dragon, one with the tail, and one with the body. Also, there are various amounts of fireballs (damage to the slayer) and mountains (re-roll) results on each die. the warriors dice have Axes, fireballs, and shields. An axe result enables you to kill the dragon once all three body parts are rolled. The fireballs damage the slayer, causing the player to lose a slayer dice. and the shields cancel out one fireball result each. Each turn consists of a player rolling a set of dragon dice while simultaneously rolling the slayer’s dice. the player wants to roll at least one axe on the slayer’s dice as well as roll the dragon head, body, and tail. For each shield result rolled a fireball result is cancelled. For each fireball not cancelled, a slayer dice is lost. If all three dragon body parts are rolled and the player has rolled an axe, resolve all shields and fireballs, and if the axe still remains, the dragon is slayed. 2 points for blue, 4 for green, 6 for red. The player decides whether to stop or continue. If a player fails to defeat a dragon, all points earned during that turn are lost. if a player stops, they bank their points. If a player decides to stop another player may use a challenge token to force you to give up some of your points in order to stop or force you to continue on to the next dragon, at a bonus 2x points multiplier. so for instance, john defeats 4 dragons (2 blue, 1 green, 1 red). He has lost 2 of his slayer dice and has only one left. He decides he wants to stop and bank his 14 points. I can play the challenge token to make them lose half their points and give me a bonus 5 points if they decide to decline my challenge and end their turn. Or they can accept my challenge and attempt to fight the next dragon with a 2x points bonus. If they fail to defeat the next dragon they lose all their points and i would get 5 points. 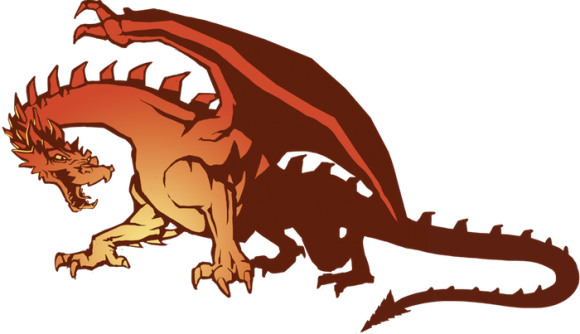 A player can only face the same color dragon again once they have defeated all three different colored dragons. So for example, I defeated the blue dragon but in order to fight the blue dragon again i would have to defeat the red and green dragon first. in order to fight the blue dragon a 3rd time, i would have to defeat the red and green dragon twice. The game is rather simple but the challenge token which each player gets is the interesting component. They can force a player to continue their turn or give up half the points they have earned in order to stop their turn. theres a little bit more to the challenge token but it sure is a fun component. you only get one or two so its something you want to wait for the right moment to use. I believe the game goes to about 40 points. and theres some small rules with the scoring that i think I am not remembering but overall, this is a small, portable easy to learn push your luck dice game which fits in perfectly with zombie dice, martian dice, mars attacks dice, Pirates vs Ninjas, and many other quick dice games. Solid 7/10 for sure. Easy to learn, but some dice games are a little easier so i give this one a 4/5. Add a Review for "Dragon Slayer"